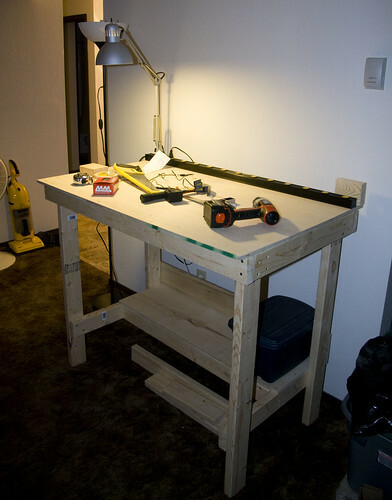 I need a workbench. My computer desk just isn’t suited for working on projects, especially ones involving electronics and soldering. I don’t have much for woodworking tools at my apartment yet so I’ve been looking for some nice plans that won’t take much to build. A few days ago I came across a bench designed by Bre Pettis for the Make: Weekend Projects program back in 2006. It’s a nice simple design consisting of plywood, 2x4s, and wood screws, something I can accomplish in a day. The design calls for making it 8′ long but I think that’ll be a bit big for my needs so I’m going to cut it in half to 4′. The new workspace will be good because I anticipate working on a few projects concurrently. On Saturday I went across town to the local Menards to pick up my supplies. 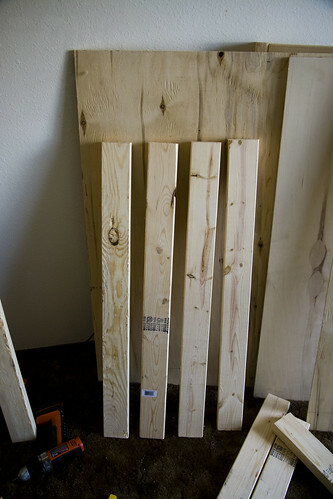 It was nice to find a 4′ x 4′ piece of plywood for the top instead of getting a 4×8 piece and only using half. I got a handsaw to do all the cutting and a $30 cordless drill for fastening things together (you could use a hammer if you’re so inclined). I got all of the 2×4’s cut down in no time, using towel covered table benches as my saw horses. One benefit of making decisions ahead of time is that I was able to eliminate an entire 2×4 from the design, saving me time and money. 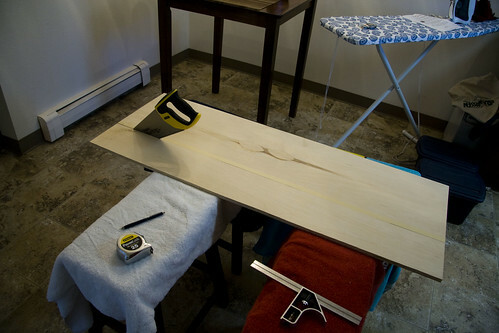 I got a little help holding down the plywood and got the table top, shelf and back brace cut next. Screwing things went together went pretty well too. It turns out that cheap and small power tools don’t have much power. I had to turn my drill up to it’s maximum torque setting just to drive 2 1/2″ screws through 2x4s. I guess I could have drilled pilot holes. Or I could have just bought a hammer and some nails. For the first (if simple) woods project I’ve tackled in a while I managed to get everything put together fairly square. The table is even near dead on level! Go ahead and make your own! Let me know how it goes.